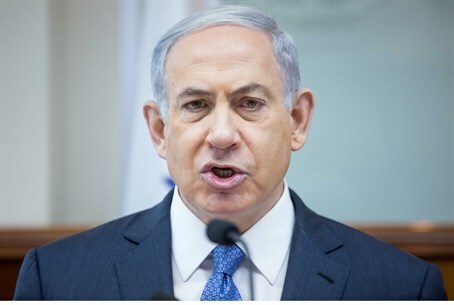 Prime Minister Binyamin Netanyahu on Thursday lost no time in condemning the French-based cellular phone provider Orange's decision to cut ties with Israel, after its CEO made anti-Semitic comments the day before saying he would "dump" Israel "tomorrow." "The absurd drama in which the democracy that observes human rights – the state of Israel – and which defends itself from barrages of missiles and terrorist tunnels, and then absorbs automatic condemnations and attempted boycotts, this absurd drama will not be forgiven," he stressed at a memorial event to the victims of the Altalena affair in Tel Aviv. The prime minister said, "I call on the French government to publicly repudiate the miserable statement and miserable action by a company that is under its partial ownership." Regarding the partial governmental ownership, Culture and Sports Minister Miri Regev (Likud) earlier on Thursday called on French President Francois Hollande to fire Orange's CEO Stephane Richard for his comments. "At the same time, I call on our friends to unconditionally declare – in a loud and clear voice – that they oppose any kind of boycott of the state of the Jews," he concluded. Orange announced Thursday it is interested in cutting ties with the Israeli company Partner that franchises its name, a day after Richard said in Cairo "we want to terminate this and to fix this, we don’t want it. In the existing contract, it gives us the option to terminate this without exposing this to a huge financial risk. If you were the CEO of this company you would act the same." "Same motivation as the Arab boycott"
President Reuven Rivlin also responded to the move while addressing the same Altalena memorial ceremony in Tel Aviv. "Just yesterday Israel faced attacks from anti-Israel and anti-Semitic bodies, who have chosen to delegitimize the state of Israel, and to launch rockets at us from the Gaza Strip. We must face these challenges together, right and left," Rivlin said. "The state of Israel was established while struggling against the Arab boycott. That delegitimization peaked just before the War of Independence - but due to a joint national effort, this boycott ceded and faded away. The declarations of boycotts today are no different in their motivation than they were then." "Worryingly, I have yet to hear from the French leadership, as we had similarly heard from Britain, condemnation of the remarks by the CEO of the France telecom company, and I expect their voices to be heard in Israel and in Cairo," added Rivlin. The president also referred to the rocket fire from Gaza on Wednesday, saying, "alongside this, we all saw how terror from Gaza continues to strike and threaten the lives of our citizens." "We won’t let anyone in Gaza, hide behind the claim that ‘there is no sovereign,'" he said, accusing the Hamas terrorist organization that holds de facto control of the region for not clamping down on the Islamic Stated-affiliated terrorists who took credit for launching the attack.